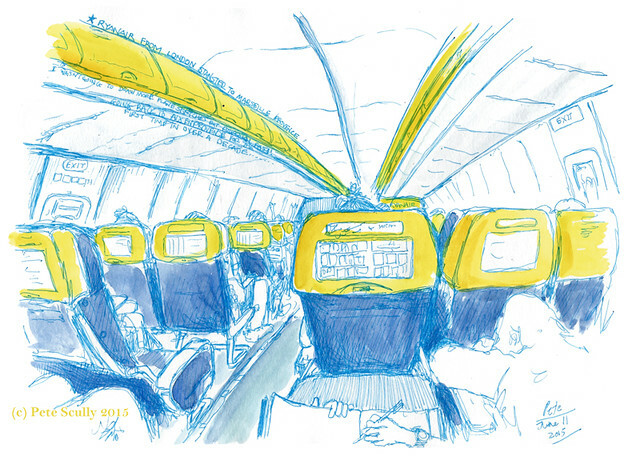 This is the inside of a Ryanair flight to the south of France. It took off from Stansted Airport on a warm Thursday morning, bound for Marseille. It had two big wings, it flew in the sky and I don’t need to write in such an obvious style, I’m not Dan Brown. Perhaps I’m nervous because I am finally posting my sketches from my trip to France. It was a big deal to go back to France this year, because I was going back to two different cities that mean a lot to me, but both of which I hadn’t visited in over a decade. Since I moved to California, France has become significantly further away. I decided a while ago that I was done with the in-flight sketch, that no longer held an interest for me, but since I was off to France to sketch and sketch and sketch, I wanted to keep my pens sharp. The cities I was headed for, by the way, were Aix-en-Provence and Strasbourg. Aix was where I was going first, the ancient capital of Provence in the deep French south. I spent a year there between 2001 and 2002 which ultimately turned out to be a pretty pivotal period (spoiler alert, I met my future wife there, and ended up in America). On the other hand Strasbourg, the capital of Alsace, where many people still speak a German-related language called Alsacian, was a trip much further back in time. I first went to Strasbourg twenty years ago in 1995 on an exchange trip between my college and a Lycee there, and totally fell in love with the city (I was a teenager, it was a good looking city). Besides, the 3rd Urban Sketchers France National Meeting was taking place there, and I really wanted to rub shoulders with the French sketching community, and test just how low the depths of my French language skills have sunk this past decade or so (spoiler alert, pretty low). This was a solo trip, a sketching trip, and I was pretty excited. Allez les Bleus! I love your work and hope you continue to sketch any place, any time and always. 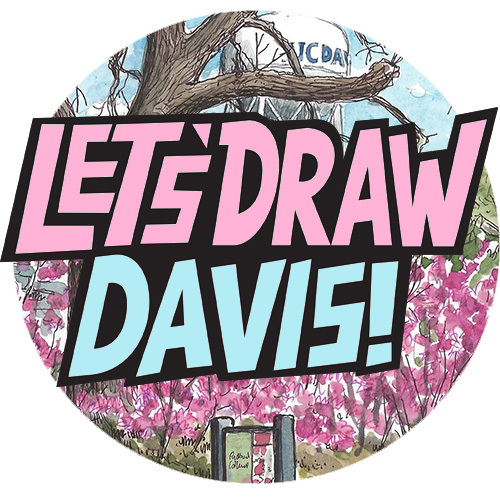 I also really like your Davis sketches. I’m headed home to Davis in two weeks to see if I can remember how to speak Californian! I left there 11 years ago for the greener, saner life of Washington, but it doesn’t mean I don’t miss it now and then – everything except the heat. I’ll walk the campus to see all the new work and compare it to your sketches.